Spot naphtha prices are tracking a mostly stable trend both in Europe and Asia this week and they are suggesting increases compared to early October levels despite the recent softening in the energy market as per the pricing service of ChemOrbis. Crude oil futures on the NYMEX declined by 1.2% for a second consecutive week last week and November crude futures were traded below the $100/barrel threshold during intraday trading for the first time since July on October 21 due to an anticipated rise in US crude stockpiles. 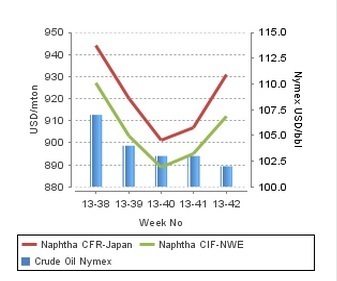 Despite softer crude, spot naphtha prices are not showing any signs of softening for now. In Asia, spot prices have climbed by $30-40/ton compared to the beginning of October owing to anticipations of a pick-up in demand later in the month when several crackers are expected to resume operations following maintenance shutdowns. Taiwan’s Formosa Petrochemical is planning to restart its No 2 cracker at Mailiao on October 31. The 1.03 million tons/year cracker was shut on September 15 for a scheduled maintenance. South Korea’s KPIC is also planning to restart its 470,000 tons/year cracker at Onsan at the end of this month after shutting it down for turnaround on October 7. Japan’s Mitsubishi Chemical’s 489,000 tons/year No 2 naphtha cracker at Kashima was expected to resume operations on October 17 following a turnaround that started on August 26. According to ChemOrbis, spot naphtha prices on a CIF NWE basis are also standing $35/ton above early October levels, supported by improved export demand. Although buying interest is currently limited in the region due to ongoing planned maintenance shutdowns at crackers of several major producers, including SABIC, Ineos and Repsol, it may improve in November when crackers are scheduled to start resuming operations following turnarounds.